Charming and comfortable low-maintenance homes, a scenic neighborhood filled with amenities, and an outstanding location surrounded by shopping, dining, outdoor recreation, and big-city entertainment… all this and more awaits at the Village of Hershey Run. Tucked into scenic woods and quiet streets on the outskirts of Wilmington, DE this Active Adult community offers a quaint and laid-back lifestyle that’s filled with possibilities for an active and social retirement. 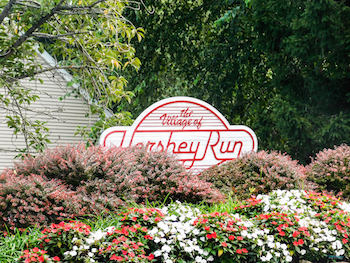 Come explore the wonders of life at the Village of Hershey Run. There’s an easier way to keep up with new listings in Village of Hershey Run. Save your searches, save favorite properties, and sign up for new listing alerts by creating your personal Property Organizer account today. The Village of Hershey Run is comprised of 192 attached homes. These homes feature low-maintenance exteriors, as well as spacious and well-maintained floorplans featuring first-floor master suites, spacious kitchens, 2 or 3 bedrooms, 2 baths, and an optional den. Most homes back to private woods and trees, and many sit adjacent to neighborhood trails. Lawn maintenance, snow and trash removal, and upkeep of common areas are included in HOA fees. Enjoy all the amenities necessary for an active retirement—right here in the neighborhood. The community Clubhouse features an exercise room and a club room for resident-planned activities, celebrations, and interest groups. Outside, there’s a heated pool and a spacious pool deck and outdoor patio for socializing, dining, or relaxing. Paved and unpaved walking and biking trails wind through the neighborhood, providing a scenic natural respite. Just down the road at the First State Plaza, you’ll find shopping, dining, a movie theatre, and a golf center. A few minutes away is a bowling alley, and in nearby Downtown Newport, you can enjoy bars and restaurants. Beautiful parks along the Christiana River offer amazing ways to get outside and get active, while the Casino at Delaware Park offers some excitement just a few minutes from home. Easy access to Route 4, Route 141, and I-95 connect you to major cities and attractions throughout the area, like the Mall at Christiana, the Delaware River, or even the bustling attractions of Downtown Wilmington, Delaware’s largest city.